You should have the right aptitude to become a writer. Becoming a writer is not an easy job. Writing is a lonely and difficult profession. You have to sacrifice a lot of things to become a writer. Read “Are you a writer?” to see if you have what it takes to become a writer. Kaizen is a Japanese word which means continuous improvement. Kaizen is not a philosophy; it is a way of life. In kaizen, one seeks for improving one’s skills regularly by analyzing the flaws and inefficiencies and removing them. One also tries to improve one’s knowledge, efficiency, proficiency, productivity, quality, etc. The improvements need not be big; in fact small improvements on a regular basis can have dramatic impact in the quality and productivity over a period of time. You can practice kaizen to continuously improve your writing. To improve your writing, you have to constantly practice your craft. This means making writing a part of your daily routine. Make writing a habit—a part of life like eating or sleeping. If you can write at a specific time every day that would be nice; otherwise write whenever you can. The time and how long you write each day is a matter of personal preference. Choose what works for you. Every successful writer is definitely a voracious reader too. You should read a lot to write well. By reading other works, you can find out how others develop an idea, how they narrate a scene, how they handle different types of writing and so on. Read the books of authors whom you admire and like. You can learn a lot by working under a master craftsman. Similarly you can learn a lot by reading the works of great authors. So find time to read every day. Good writing means following the rules and not making mistakes. Learn the grammar and practice what you have learned till you have mastered it. Read the grammar books as well as the style guides to learn the rules as well as the usage. Once you have mastered the rules, then you know when you can bend and break them. That knowledge—the ability to write without mistakes even when you are bending or breaking the rules—is very crucial for a successful writing career. Spelling is a very important factor that decides the impression you create. A work with a lot of spelling mistakes implies that you were not careful and you did not review your work. The spelling checkers in the word processors are great tools in finding misspelled words, but they cannot find wrongly used words. For example, if your write ‘form’ instead of ‘from’ or ‘affect’ instead of ‘effect’ no spell checker will find it as they are valid words. Reviewing and editing your manuscript is the only way to find those errors. But there will be occasions when you have to write without the help of spell checkers and if you don’t know the spelling then it can create problems. So do not be too dependent on technology; use it when you have them at hand, but develop the skill and ability to survive without them. Having a good vocabulary is a must to become a good writer. Vocabulary building is a serious exercise. You should not only know the words and their different meanings but also know how to use them correctly. While reading, you will definitely come across new words—words that are not part of your vocabulary. Write them down, find their meanings, see how they are used, learn how to use them properly, and practice the usage until you are thorough. Over a period of time, you will have an excellent vocabulary and your writing will dramatically improve. Do not use flamboyant and esoteric words just because you know them. Use simple words whenever you can. You can craft beautiful sentences with simple words. Use the ‘big’ words only when they are apt for the situation. Never try to impress your reader with your vocabulary; instead try to impress with your writing—the content and the way it is presented. 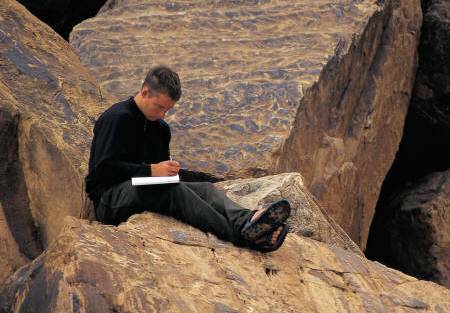 Some writers can write from anywhere they want. But most writers have a place where they are comfortable. You should create a writing space for you. It can be a table in your bedroom or it can be your study with all your books, reference materials, computer, notebooks, etc. The writing space should be comfortable, and free from disturbances. If you have some specific activity or habit that will help to relax and be creative then your writing space should have the facility to do that. For example, some writers prefer music in the background while some other prefer a silent room; some writers would like to write their first draft with pen and paper while some others prefer to key in their thoughts and ideas directly into the computer. Create your writing space according to your needs, comforts, and preferences. Content is said to be the king in any writing. Your knowledge of the subject will clearly show through your writing. Be careful about what you choose to write. If you choose a topic in which you have excellent knowledge and practical experience, then you can write with great authority. You can be convincing and persuasive and can help the readers understand the topic better by using real world examples. So gain knowledge and experience about the topic you are planning to write. You can borrow the wisdom, knowledge, and experience of other experts in the field by interviewing them. Try to be original in what you are writing. You can borrow from others. But make sure that you transform them and add value to what you are borrowing. If you have borrowed the ideas from others, then don’t forget to acknowledge your sources. You can make your work original by your writing style, the way in which you present the ideas, explain them, and how you organize and structure your work. Be very clear in what you are writing. Don’t be ambiguous, as this will confuse the reader and that is not something you want. Ambiguous writing also is the lack of focus, logical thinking, and organization on your part. Your final work should explain what you are trying to convey clearly and logically. A step-by-step approach starting from the fundamentals is the best way to present any topic clearly and this is the approach that the readers will understand the best. Be as precise and accurate as you can. In technical writing, the importance of precision and accuracy cannot be overemphasized. When you are mentioning measurements like length, volume, speed, acceleration, capacity, etc. very clearly specify the value and unit of measurement. If you are not mentioning the exact values, then you should clearly specify that what you are giving are only approximate values. Write simple sentences using simple words. Do not make sentences very long or verbose. The sentences should be clear and concise. Try to use active voice whenever possible. Once you have finished writing, run your work through a text analyzer and check the readability statistics to see if it is suitable for your target audience. If not, make the necessary corrections and modifications. Your tone should be suitable for the topic and audience. Do not use formal tone in an informal piece of writing and vice versa. Use humor with care. Use it only if you are sure that it will work. Use negative tones and emotions like sarcasm, bitterness, etc. only if absolutely necessary. In the case of highly technical and formal documents do not use humor or any other emotion. Condescending and preaching tones are best avoided as it makes the writing dull and judgmental. Also watch out for and remove any prejudices and biases that might creep into your writing. The length of your work is a very important factor. Try to make your writing as short as possible without sacrificing on content. This can be achieved by many rounds of editing and revisions. If the document is too lengthy, people might hesitate to read it; if it is too short, its usefulness might suffer. It is you as the author who should decide how long the work should be. In some assignments, like magazine articles, you will be given the word count and you have to say within that limit. A picture is worth thousand words. You can vastly improve the ease of understanding by having an illustration. When explaining complex concepts or things, a picture or illustration is the best way to make the reader understand what you are saying. You can show the exploded view of a machine with its parts labeled and it becomes self explanatory. Similarly a complex computer algorithm could be explained easily by drawing its flowchart. Use of illustrations is very important in technical writing as you are always trying to explain complex concepts and objects and illustrations and pictures can definitely help a lot. The quality of the illustrations and pictures is another important factor. A poorly drawn illustration might complicate and confuse the reader. So create and use your illustrations and pictures with care. Lists—both bulleted and numbered—help in simplifying ideas and improves the readability. You should know when you can use a list. Lists are ideal for situations where you can enumerate the ideas. For example, advantages of Database Management Systems, limitations of data mining, parts of a computer, classification of digital computer systems, different types of software, etc. are ideal candidates for lists. Lists can also be used to break the monotony and tedium of continuous text. Tables can be very effective in comparing similar objects or ideas. When more than one object or idea that you are discussing has similar properties then they are best highlighted by using a table. For example, features of different computer models, properties of different data models, sales volume for the past 10 years, etc. are best expressed using tables. Table can also be used for effectively presenting the properties and characteristics of an object or concept. For example, you can give the specifications of a computer, features of a car, names and prices of your organization’s products, etc. in a table. Like lists tables can also break the monotony of the continuous text. Providing examples is one of the best ways to make the reader understand what you are discussing. Suppose you are explaining data mining. If you can explain the concepts and advantages using a real world example, say how the marketing department of a car manufacturer uses its sales data over the years to predict market trends and identify potential problems, that would help the reader to better understand what data mining is, how it can be used to run his organization more effectively, etc. So, use real world examples, case studies, and anecdotes wherever appropriate as it makes the writing interesting and will help the user to identify with the topic that is being discussed. It also will improve your credibility as an expert. Asking questions, giving problems to solve, situations to debate and discuss, etc. will help the reader in checking what they have learned. If you use case studies, problems or situations and ask the reader to discuss what they would have done, if they were faced with the same problems, it will force the reader think and use the information that he has read. This thinking and reviewing will help in reinforcing the ideas and concepts that you are discussing. So make the reader a partner in the learning process by making the writing interactive—a dialogue instead of a monotonous monologue.